Notice that I don't use the standard color scheme. With set BOOST_TEST_COLOR_OUTPUT=1 text is light green on gray, bad to read. set BOOST_TEST_COLOR_OUTPUT=0 does black on gray. After that the colors are set to my scheme. Light red on gray, OK to read, but reset to dark red on gray. I have to use the color command to reset the colors. With command line options it's all the same. 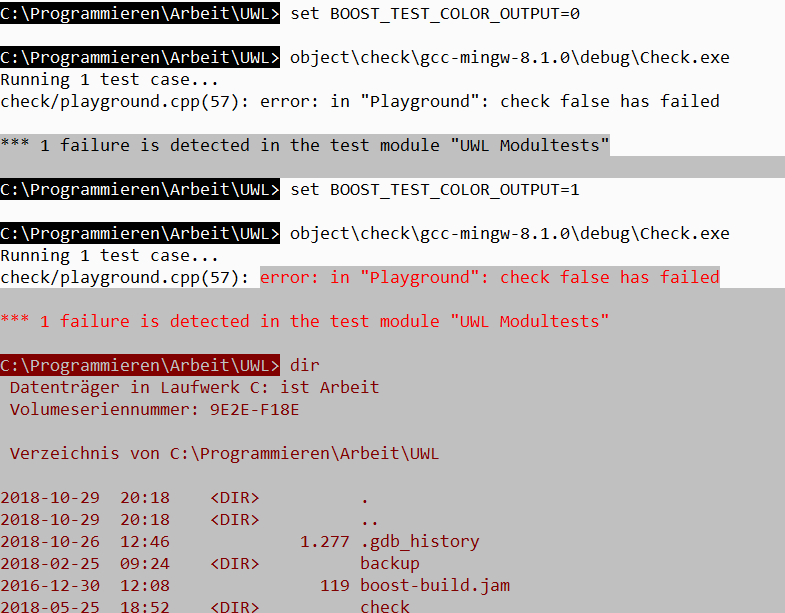 Hmmm, how useful can colors be, if the standard output (no error detected) is only one short line? > Notice that I don't use the standard color scheme. 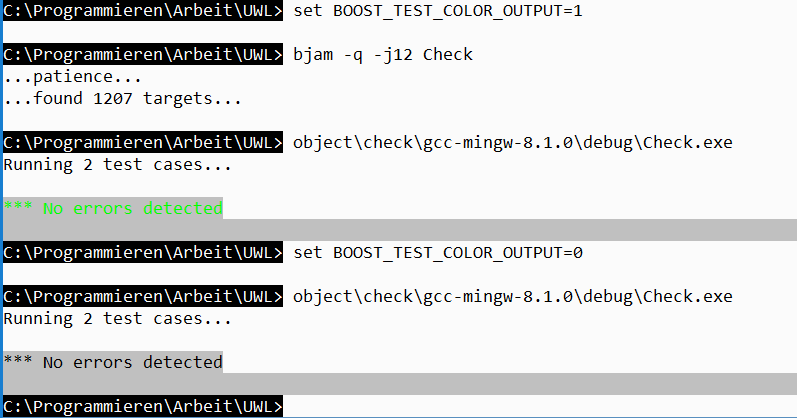 > With set BOOST_TEST_COLOR_OUTPUT=1 text is light green on gray, bad to read. set BOOST_TEST_COLOR_OUTPUT=0 does black on gray. After that the colors are set to my scheme. > Light red on gray, OK to read, but reset to dark red on gray. I have to use the color command to reset the colors. > With command line options it's all the same. > Hmmm, how useful can colors be, if the standard output (no error detected) is only one short line? on Windows. I am happy to receive any suggestions to improve this! > I try to avoid registration on free services. FYI, GitHub also offers paid account. > I have read it, but was so far been too lazy to compile it. > needs attention, also no colors needed. The variable BOOST_TEST_COLOR_OUTPUT is there for your need. > you have to take into account. adjusted the background and I made the hypothesis of the default one. > default should be colorless mode. amount of information/logs significantly faster. > That are my first two general thoughts. you want an improvement, let me know.